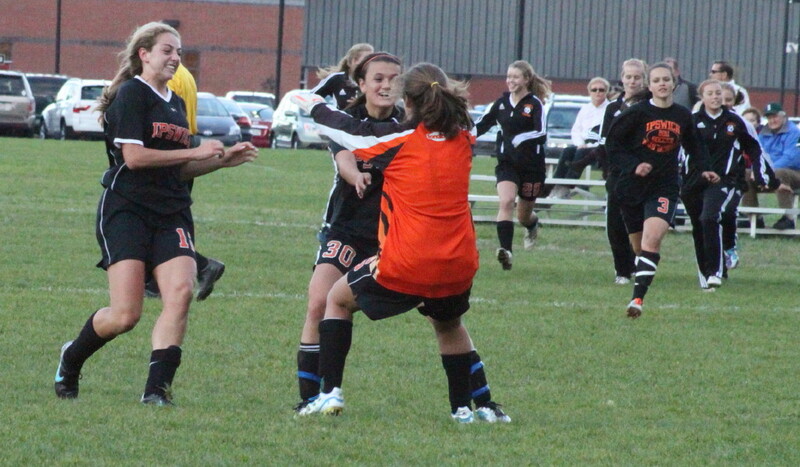 Tigers rush to goalie Molly Markos after 2-1 win over Masco. 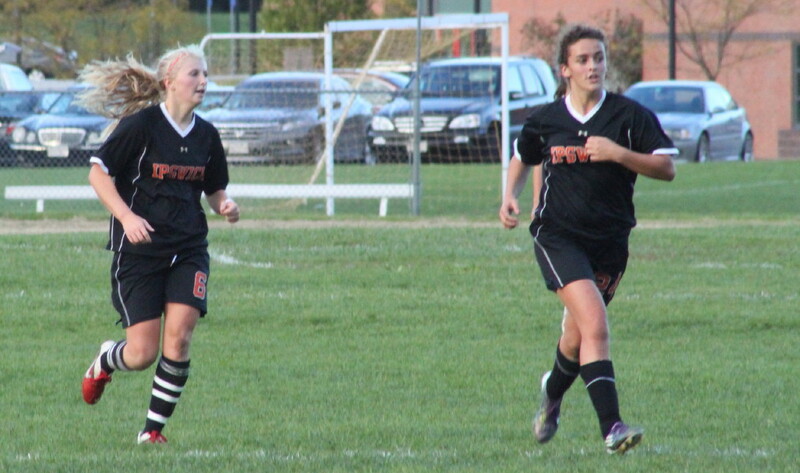 (Boxford) One girls soccer team was undefeated in its last ten games and the other in its last eight games. 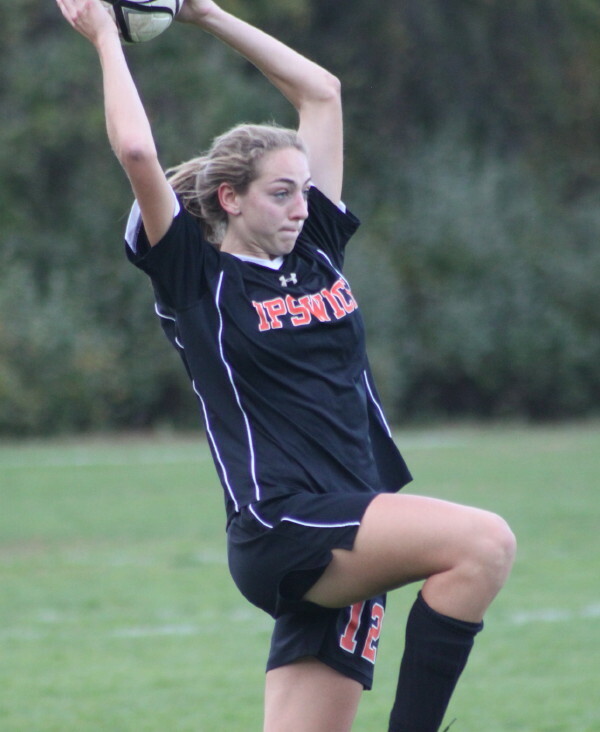 It figured to be a good match….and it was as Ipswich defeated Masconomet, 2-1, before a good crowd at Senior’s Day at Masconomet on Friday afternoon. 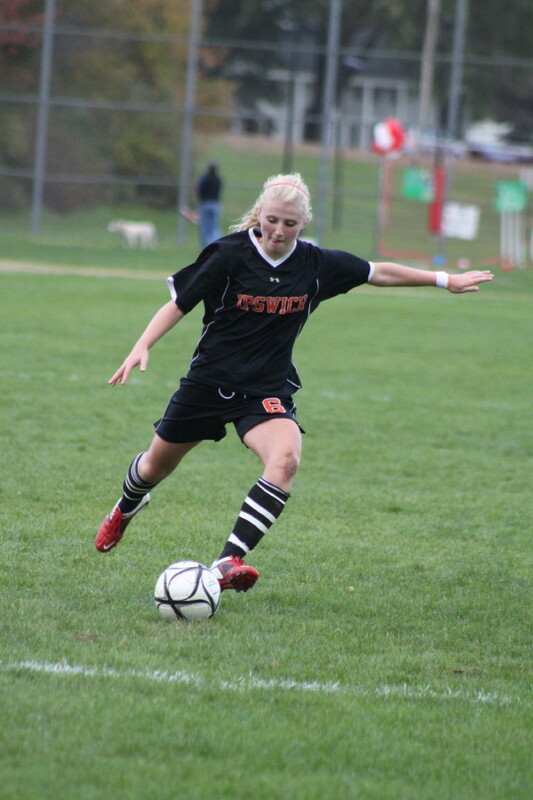 2010 Cape Ann League Division 2 Player-of-the-Year Hannah Weagle was huge for Ipswich (10-1-3). The talented senior scored a goal in the first half on a direct kick and then earned the assist on teammate Sam Brown’s game winner in the second half. 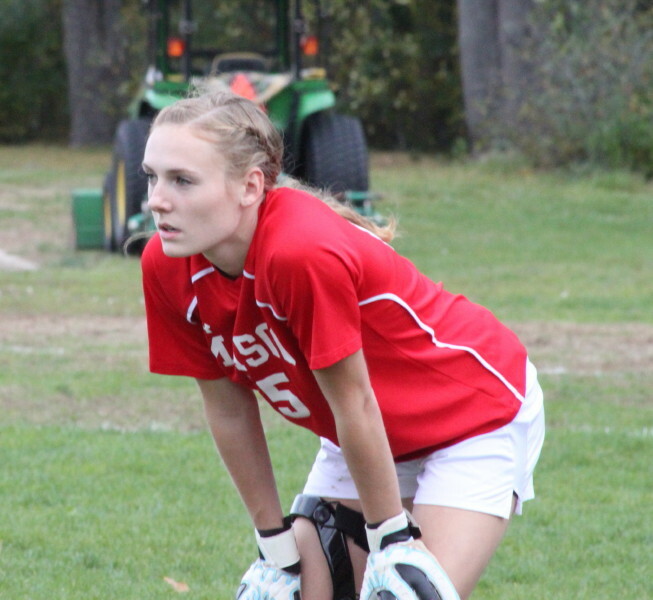 Hannah was also very active in the midfield area and part of an Ipswich defense that gave Masco limited scoring chances during most of the game. The Chieftains (9-4-2), however, rallied late in the first half on a scramble in front to tie the score (Mia Farnham from Leah Connerty) and put their best sustained effort into the opening ten minutes of the second half. 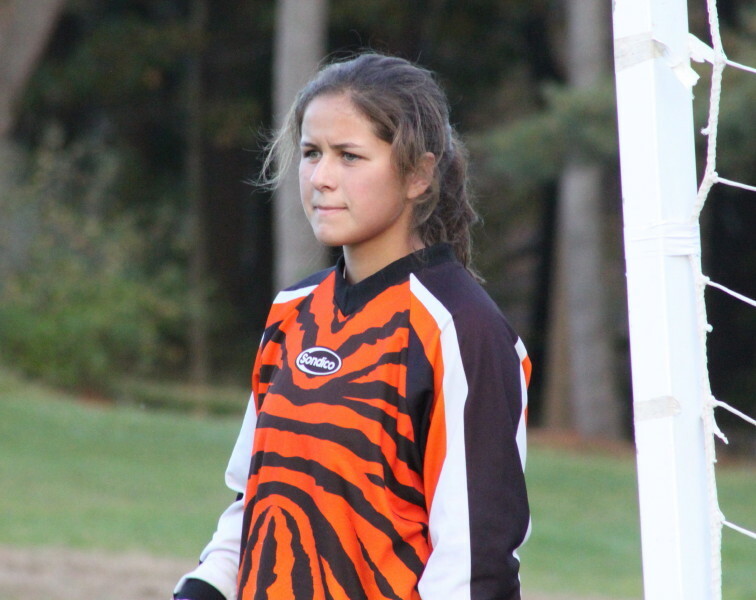 During that hectic ten minutes, Masco took six shots, including two direct kicks and a corner kick, but the Tiger defense led by junior Courtney Long and goalie Molly Markos held on. 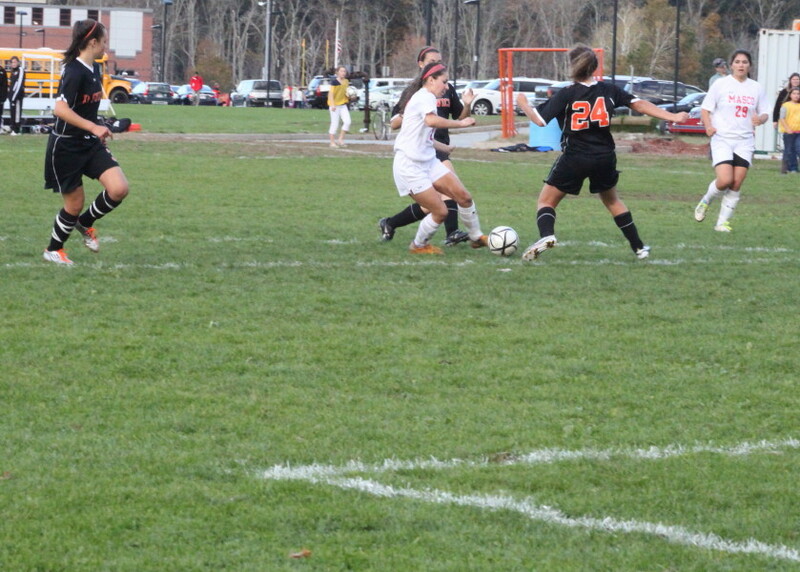 Hannah set up the game-winner seventeen minutes into the second half. She broke away from a sideline battle for the ball and took a hard shot toward goal from the left. Sam Brown raced in from the right and put a foot on the ball redirecting it on goal and into the net past Masco goalie Kendal Pratt. The Tigers had three golden chances in the first half and cashed in on one of them. The first chance was a goal from in close by Katie Monahan that was called back because of an offsides after nineteen minutes. Hannah Weagle delivered on the second chance. 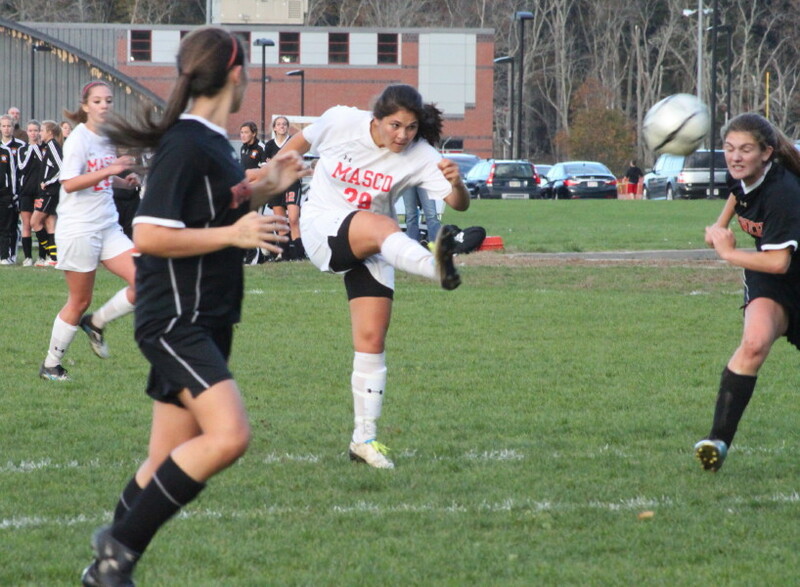 First she drew a Masco violation with some penetrating dribbling. Then she took the resulting direct kick and beat goalie Kendal Pratt with a shot into the upper left-hand corner of the net with twenty-three minutes played in the first half. Six minutes later Hannah was back with the Tigers’ 3rd scoring chance with another direct kick attempt. This time goalie Kendal Pratt made a fabulous stop diving for the near post to deflect the shot out. This was the stop of the game. Leah Connerty (10) about to get an assist. The Chieftain’s broke through at 38:07 after a direct kick by Paige Pratt. From where I was (the other end of the field) it looked as if Leah Connerty got a foot on the ball to put it up in the air and Mia Farnham followed with a header past the Ipswich goalie. 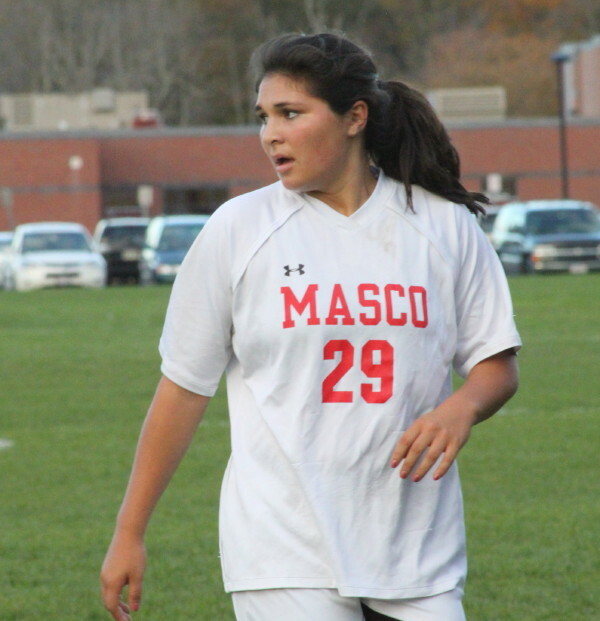 This was my second time seeing Masco – I saw them play a 1-1 tie with Georgetown. Paige Pratt is an excellent defender. Mia Farnham and Taylor Evans create real problems on the scoring end because of their strength and persistence. They both had pretty good scoring chances versus Ipswich. The Ipswich/Masco JV game was played right beside the varsity game. I suspected that whistles and stray kicks might be a problem but they weren’t. I saw Ipswich in tournament play last season and Courtney Long is terrific as the last defender. The sophomore has a strong kick with either foot and doesn‘t panic with the ball. Hannah Weagle was all over the field. Most high scorers in soccer don’t offer much in the way of defense but Hannah was active at midfield and in the box during corner kicks. 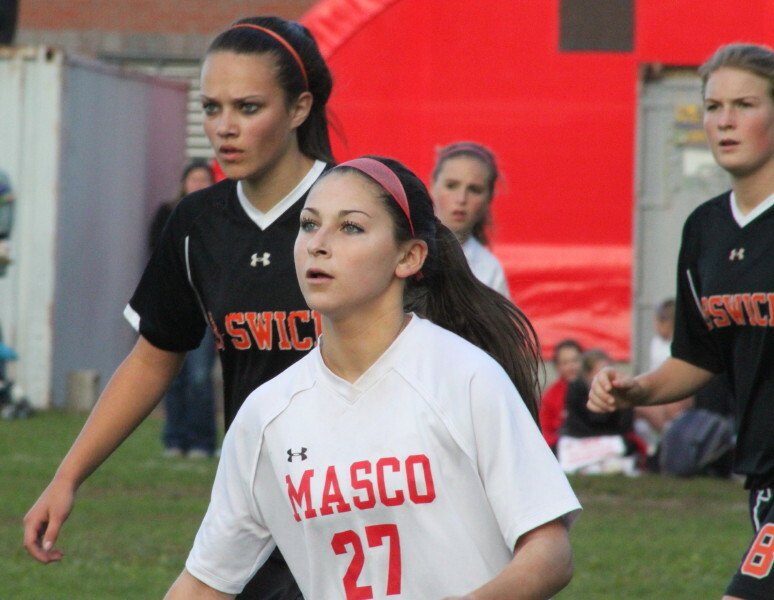 Ipswich (11-7-4 in 2010) made the D3 North Finals last season while Masco (17-2-2 in 2010) ) made the D1 North Finals. They will be in the tournament again this year. Next for Ipswich is Triton under the lights in Ipswich on October 25th (Tuesday). Masco travels to Andover for a 5PM game on October 24th (Monday). Further ahead, Ipswich has back-to-back road games with Newburyport (October 31st) and Georgetown (November 1st). Those should be very competitive matches. (I take full responsibility for the contents of this story.) The pictures will enlarge to normal size if you click on them.